Dewsbury MP Paula Sherriff has visited a local nursery to congratulate the team on achieving the Millie’s Mark accreditation, filmed by Made in Leeds. 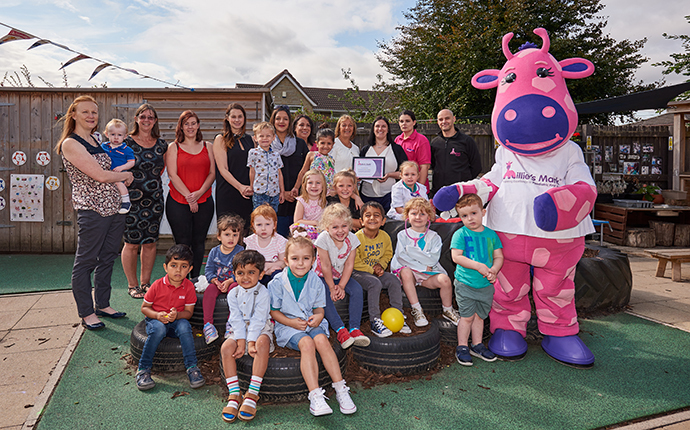 The Co-operative Childcare in Dewsbury has become the 300th nursery in the country to be awarded Millie’s Mark, the gold standard for paediatric first aid. Paula Sherriff MP was joined by Stella Ziolkowski, NDNA’s Director of Quality and Training, Dan Thompson from Millie’s Trust, Joanne Wilson the nursery manager, Millie the Giraffe and staff and children from the nursery. As well as presenting a certificate, Stella also unveiled a new Millie’s Mark banner for accredited nurseries. Children also had the opportunity to explore inside an ambulance. Purnima Tanuku OBE, Chief Executive of NDNA, said: “We are delighted to have The Co-operative Childcare Dewsbury become the 300th accredited nursery. It is excellent for parents to be able to see that a nursery team have pushed themselves to meet the highest standard of first aid and reassure them that their children are in safe hands. The Co-operative Childcare has made a commitment for all its 45 nurseries to have achieved Millie’s Mark by the end of this year. So far about half of their settings have been awarded the accreditation and all nurseries have applied for it. Millie’s Mark is a quality mark for first aid and was introduced by Millie’s Trust after a lengthy campaign to ensure all staff hold paediatric first aid qualifications and have the confidence to administer emergency help when needed. Millie’s Trust was set up by Dan and Joanne Thompson who lost their daughter following a choking incident in a nursery. The Mark is supported by the Department for Education (DfE) and administered by National Day Nurseries Association (NDNA) which is based in Huddersfield, West Yorkshire.